Next weekend it is about to get real. For Game of Thrones fans you know exactly what I am talking about. It may be the start of summer, but Game of Thrones fans from throughout the realm are preparing for winter when the hit HBO series returns July 16. 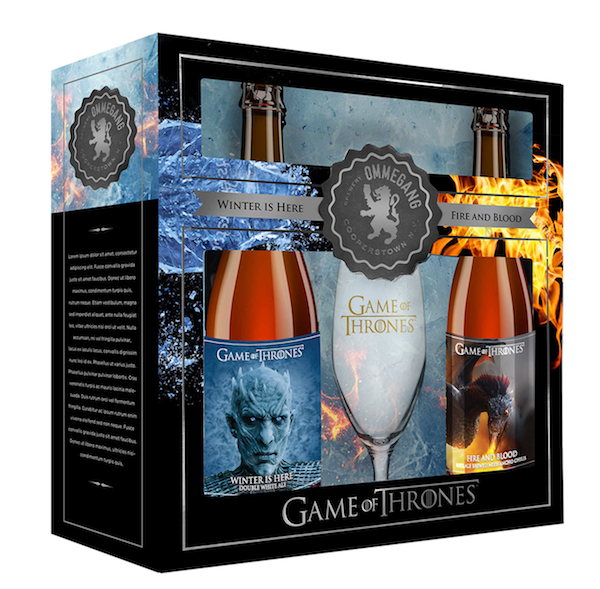 And while those fans will still be sipping Bend the Knee Golden Ale throughout Season 7, Brewery Ommegang and HBO Global Licensing are proud to announce that a brand new beer in their successful partnership, available this fall, will confirm once and for all that, finally, Winter is Here! An 8.3% AVB Belgian-style double white ale with the fearsome Night King emblazoned on the label, Winter is Here will be available in 750ml single bottles, on draft, and also paired alongside previously released Fire and Blood Red Ale in a collectible gift pack complete with a commemorative glass. Suggested retail price is $11.99 for the individual bottles and $23.99 for the gift pack, both of which will be on shelves in late October. Print article This entry was posted by Art Eddy III on July 10, 2017 at 12:56 pm, and is filed under Entertainment, Lifestyle. Follow any responses to this post through RSS 2.0. Both comments and pings are currently closed.